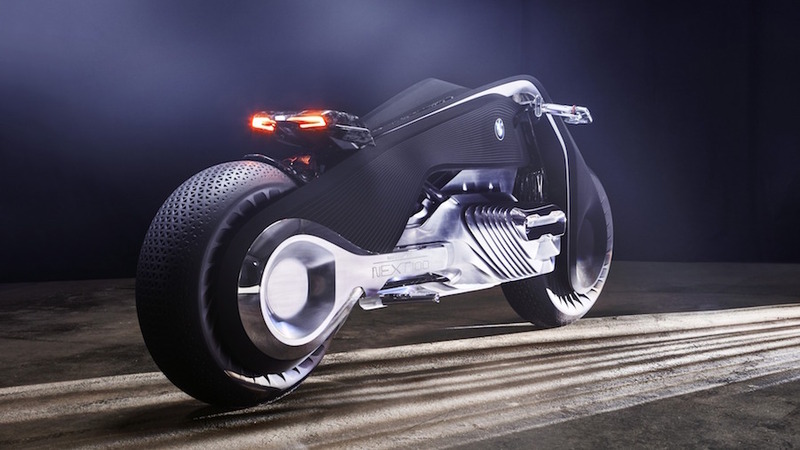 Based on the assumption, says BMW, that mobility is set to become increasingly multifaceted and connected, the German firm has conceptualised the motorcycle of the future. It’s called the Vision Next 100 and while it’s got all those things you’d expect from a futuristic BMW-branded motorcycle such as a zero-emissions power plant and an oh-so recognisable BMW shape, the once conservative bike builder has reimagined a few of the mainstays of motorcycling, and rather significantly. A joint-free flexible frame, for example. Or a fully active tread pattern on tyres which take care of damping duties. Or, presumably a move towards autonomous riding technology, a bike so clever that it negates the need of any sort of protective clothing. Whether it’s BMW reimagining motorcycling, whether it’s reimagining the future of mainstream mobility or, if indeed there’ll be any difference in 30 year’s time is still yet to be seen. 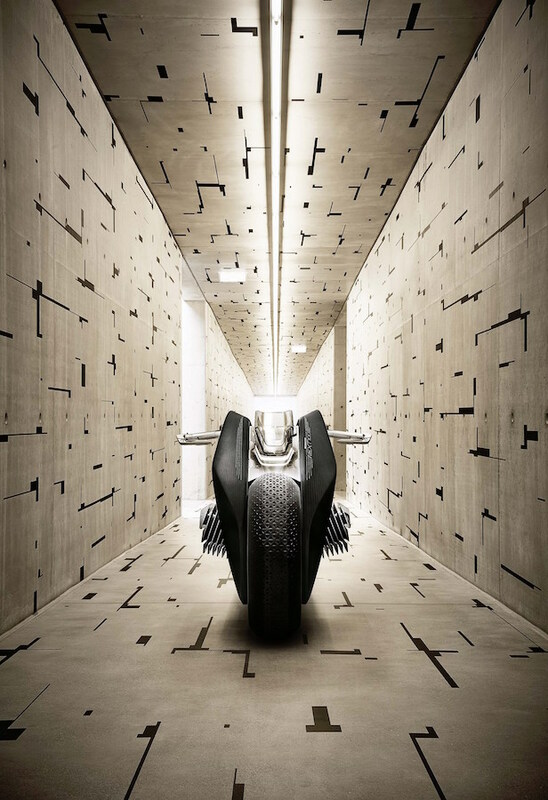 But one thing’s clear, instead of an evolution of modern-day motorcycling, the Vision Next 100 completely revolutionises the motorcycle. Here’s a few examples. Visually, the all-black ‘frame’ boasts styling hallmarks of the firm’s early R32, but that’s where any reference to days gone by ends. It’s a one-piece affair which incorporates both the front and rear axles, a fluid and fully integrated design which doesn’t require joins, welds, or even bearings, the firm says. Why? Because it’s flexible. And that allows frame-assisted steering. Turning the handlebar adjusts the entire unit and changes the direction of the bike. The amount of flex is dependent on speed: at standstill, the Flexframe steering is light, at higher speeds it’s rigid. Frame assisted steering from a single unit is one thing, but the reason modern motorcycles require joins and multi-section chassis components is simple and important: suspension. At first glance, the Vision Next 100 lacks suspension ability but because it has transferred the future’s damping duties from the humble fork and monoshock to the tyres. The oversized and presumably pneumatic tyres not only take care of damping, but they also boast a fully active and variable tread pattern to ensure the machine always has the best possible grip in all surface and weather conditions. This is where the concept becomes revolutionary, if not a bit over the top. Because according to BMW, mobility technology will become so advanced that protective clothing will become defunct. A self-balancing function will keep the machine upright at any speed, a so-called digital companion will offer riding advice and make adjustments when and where it sees fit, but it’s the required glasses which has all the signs of self-riding motorcycles of the future. While you’re looking through them, they’re doing looking of their own, and continually adjusting the bike depending on both the road ahead and your riding style. A mix BMW believes results in an uncrashable machine.